of the European Integration NGO Karen Bekaryan told reporters today. expressed in the pan-Armenian declaration proclaimed yesterday. opposite. According to him, this put Turkey in an awkward situation. 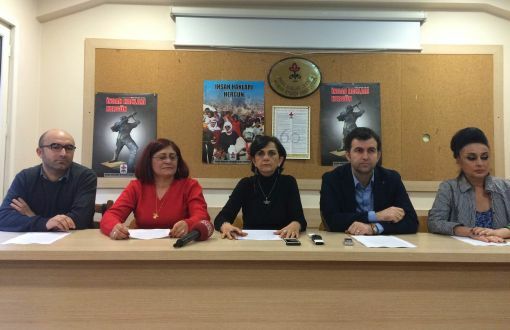 Turkologist Hakob Chakryan told a press conference today. makes silly statements," Chakryan said. process, Turkey's denial policy is becoming more and more aggressive,"
with Turkey to hold their leaders back from making the moral choice. considering acceptance of the Turkish president's invitation immoral. expectations. "I am hopeful morality will take the lead anyway,"
the Genocide condemnation process in every possible way. Genocide produce a counter effect." and the press will be even more, and it will have its positive impact,"
Turkey would be a test as to their real preferences. that many countries have now begun preferring the values to interests,"
April 24. But I do not see any such country," he added. press-conference. He also added that just the above mentioned "three"
the events dedicated to the 100th anniversary of the Armenian genocide. the genocide, as it is not beneficial to them", - Shakaryants said. visit Turkey to celebrate the so-called "Gallipoli victory". WHO WILL BE PRESENT AT THE EVENTS MARKING 100TH ANNIVERSARY OF THE GALLIPOLI BATTLE? "Signal left and turn right." Today, we are confronted with the same kind of politics with Turkey. celebration, creating a theater of the absurd in his foreign policy. hypocrisy of Turkish policy toward Armenia. by the Turkish government to attend this fictitious celebration. of the invited guests, because Turkey lost the entire war in 1918. Centenary Is a Shameful Attempt to Hide the Armenian Holocaust." crimes against humanity committed during the Armenian extermination." face-saving effort vis-a-vis their Russian allies. the Armenian Genocide, injecting a drama within another drama. kept our relations captive, was a testament to this determination. stereotypical assertions of the past." "If you want land, come and take it. Land can only be taken by blood." admitting the undeniable fact of the premeditated genocide, Mr.
genocide as "relocation policies enforced under wartime circumstances." when the Kurds can contribute to his success. of the promises have not been delivered yet. their turf in Kobani, Syria. return to the days of September 6 remains a possibility. active with its virulent leader, Dogu Perincek. With all these perils on their way, Davutoglu's "new beginning"
Edited by Yervant1, 11 February 2015 - 10:54 AM. 5 NGOs urged world leaders “not to accept President Recep Tayyip Erdoğan’s invitation to Gallipoli on the 100th Anniversary of Armenian Genocide but to visit Yerevan instead”. Previously, President Erdoğan announced that they will commemorate on April 24 the defense of Gallipoli - a ceremony observed on March 18 every year. He also invited world leaders to the northwestern province of Çanakkale to join the ceremony. The associations (Human Rights Association (IHD)’s Commission Against Racism and Discrimination, Izmir Assyrian Friendship, Culture and Solidarity Association, Nor Zartonk, www.suryaniler.com Culture Platform and Zan Social, Political, Economic Research Foundation) made the statement protesting Erdoğan’s invitation at IHD Headquarters in Istanbul. “April 24 worldwide symbolizes the beginning of Armenian Genocide,” IHD Vice Chairperson Meral Çıldır said in a statement. “As the 100th anniversary of Armenian Genocide draws near, we, groups and peoples that struggle against the denial of the Genocide, protest the president’s invitation and urge world leaders to visit the genocide memorial in Yerevan instead of Gallipoli in Çanakkale. “The mentality that founded the Republic of Turkey is the very mentality that committed the Armenian - Assyrian Genocide in 1915. “For us, 24 April 2015 has a huge importance. We want to face our history. We want this understanding to be questioned as it has been told us wrong and brought up our children with lies. We know that the Genocide in 1915 is still not openly mentioned by many countries but we we are asking a bit of conscience. Edited by Yervant1, 06 February 2015 - 10:25 AM. In an interview with NTV, U.S. Ambassador to Turkey John Bass, among other issues, spoke about the Armenian Genocide and the U.S. participation in the Battle of Gallipoli centenary events. the Armenian Genocide Centennial and Armenian-Turkish relations. `Armenpress' presents the translated version of the article. Turkey will celebrate its heroic episode during WWI. course, this isn't something that makes the Turkish authorities happy. Chalcedonians and Orthodox Greeks) were massacred. to the leaders of more than 100 countries. victories in Wehrmacht in the Eastern Front during WWII. that battle took place on April 25th, not April 24th. a day before the battle. denied that the Armenians were loyal subjects of the Ottoman Empire. and so they shouldn't be killed. barbaric acts to eliminate the traces of the cultures of the victims. Religious buildings are robbed, destroyed or in ruins. recognized the Armenian Genocide continue to live with this shame. countries to visit Yerevan instead of Canakkale on April 24th. manipulating history, and it shows that lies and denial still prevail. the Armenian Genocide and their conscience," the speaker said. the Assyrians and the Greeks of Pontos," Tozduman said. cooperation of the Assyrians of Izmir Zeynep Tozduman said. society is also against the recognition." Hey Mr. ErDOGan it's very clear as to who is turning this into politics! This so called subhuman has no shame. ceremonies, the Hurriyet Daily News reports. co-organized by Bogota Externado University and Ankara University. hand has always been rejected by the influence of Armenian diaspora." of remembrance for the Armenian victims of the 1915 events. Sargsyan reportedly denounced Erdogan's invitation as a "short-sighted"
attempt to overshadow the 100th anniversary of the 1915 events. hundreds of thousands of martyrs. But they didn't do that," he said. our efforts for peace and dialogue." and dialogue with respect to the 1915 events," Erdogan said. Recep Tayyip Erdogan, reports News.am . against Turkey. We have spared no efforts for opening a new chapter. peace," the Turkish leader said. the Centennial of the Armenian Genocide committed in Ottoman Turkey. has always been rejected by the influence of Armenian Diaspora" . nothing to do with the truth, reality and logic," said the Turkologist. 3 million) which has fair demands anchored on universal human values. statement reflecting any norm or sound logic," he added. our hundreds of thousands of martyrs. But they didn't do that,"
to politeness, and his discourse is known with its ill-bred nature,"
right person to demand respect for rules of politeness. Davutoglu produced his latest "generosity" toward Armenia, i.e. known as Ankara's promotional ethnic forum. this "peace" offer and to whom? Dirty blackmailing tricks all over again! Once more, honesty (Truth) versus business (Money) dilemma, it's obvious what the west will do! is blackmailing the U.S., trying to engage the West in its dirty game. the Turkish Hurriyet reports, according to "Armenpress". Armenian Genocide and that only after that will Turkey seal deals. Turkish government started being pressured by its Western allies. and the European Eurosam Concern are the contenders. WILL TURKISH-US RELATIONS SURVIVE THE ARMENIAN TEST? voted through the House of Representatives' Foreign Affairs Committee. deport Armenians "collaborating with the invading Russian armies"
a high symbolic and emotional value for Armenians. same day have not been welcomed with much enthusiasm so far. Turkey, which was signed through Swiss mediation in 2009.
activity umbrella, leaving aside all their inner disputes for 2015. It is not possible to say the same for the Turkish side. Foreign Minister Mevlut CavuÅ~_oglu has been quoted as warning U.S.
Ankara would "radically review" its relations with Washington. from the Syrian and Egyptian administrations to Israel. Kerry alerting him to the pressure on the Zaman media group. Overall, they made up almost half of the signatories of that letter. Congress, through the Rumi Foundation, which is in line with Gulen. gain for the White House, if not for the Turkish people. defense equipment already in Turkey could expose NATO secrets to China. before April 24 is out of the question." A senior diplomat confirmed that Ankara first wants to see the U.S.
1915-1920] will be an important input for our final decision," he said. And a "top government official for defense and security issues"
a decision on the contract." as Defense News notes, the sixth time it has made such an extension. keeping open the option of turning to China for the $3.4 billion deal. by Anadolu Agency on Thursday. The prospect of the Chinese deal going ahead will dismay Turkey's U.S.
as its 100th anniversary nears. had been received in the statement. The government has said no decision would be taken before April 24.
of genocide. Turkey rejects the label. the Economic Policy Research Foundation in Ankara. political leverage on the Armenian issue ahead of April 24." Raytheon and Eurosam to renew their proposals. two countries that border Turkey. is not a military decision since the superior system is the Patriot,"
missile guidance systems, he said. which the U.S. considers a security risk. its strategic defense system and make it part of NATO." "have very negative consequences for Turkish-U.S. relations." debate a resolution to recognize the killings. existing infrastructure by linking up with a rival military power. a matter of technological compatibility - it's much more than that." for Turkey's defense and will be used without integrating with NATO,"
as an indispensable regional power. many historians consider the 20th century's first genocide. Ali Unal wrote last year in the pro-government Daily Sabah newspaper. weapons in their inventories," Erdogan told reporters in 2013.
which has come to dominate so many of his statements." efficient architecture without those assets." only be relied upon as a part-time ally, rather than just an ally,"